As I mentioned last week, September is National Preparedness Month– a great opportunity for us to get our ducks in a row when it comes to organizing and securing our most important documents. In the first post of a 3-part series on emergency preparedness organizing projects, I introduced you to one of your best “emergency preparedness friends”–the fireproof (and waterproof) safe. Today, we’ll chat about another emergency preparedness topic–using cloud storage services to protect vital documents. Since I’m a paperless gal at heart, of course my vital document organizing system includes scanning and uploading all of my documents to a cloud storage service. When I decided to take that project on, I did some research on best practices, and learned about SafelyFiled. Unlike your generic Dropbox or Google Drive storage, SafelyFiled is specifically designed for the secure and private storage and sharing of your “critical life documents”, as they call them. I liken it to storing your digital photo collection in Dropbox vs. a designated cloud photo storage site like Forever or Flickr. 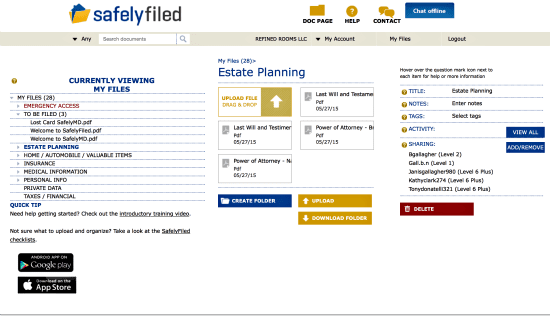 The ability to easily share individual documents or entire folders of documents with my family members, attorney, etc. An ancillary service offered by SafelyFiled is SafelyMD. SafelyMD is a service which enables you to store key medical information about yourself and your loved ones in the cloud that can be made available to EMTs and emergency room staff if you are in an emergency situation and unable to communicate. Once you’ve inputted your medical data into SafelyMD, you can generate a Emergency Medical Data Card with a QR code that can be used my emergency personnel to quickly obtain a medical history on you. Some of you may think that it’s overkill to have your vital documents stored in both paper and electronic version. I believe that when it comes to organizing this category of my belongings, its impossible to be too overzealous. I figure I’m covered in the event of an apocalypse that involves the demise of the internet (I’ll still have my paper versions) AND I’m covered if somehow my fireproof safe fails to do its job or gets taken during a burglary (I’ll still have my digital documents in SafelyFiled). Better to be paranoid and safe than sorry…that’s my motto! Where are your vital documents stored? Would they survive a natural disaster? Are they easily accessible in an emergency? What obstacles are getting in the way of tackling this important organizing project? Do you already have your emergency preparedness ducks in a row? Share your system below!